Sometimes on a long trip you want something to entertain the kids or yourself that doesn’t involve reprogramming the GPS to drive you through a barn. For that bit of entertainment we have added magnetic travel games. Many popular games are represented, such as chess, checkers, backgammon, crosswords, hangman, tic-tac-toe, and four-in-a-row. All the games are in 5-1/4″ flat tins designed to fit easily in a suitcase or travel bag without taking up too much space. All games have the required number of pieces to play the game and make for great fun on the road. Astronomy Hints #10 – So you got a new telescope for the holidays! What now? Be it X-mas, Hannukah, Kwanza, Solstice this is the season for getting telescopes as gifts. Sadly, many of these scopes might be rushed into usage and some critical steps might be skipped. This can result in a frustrating experience for a budding young astronomer who may give up their new hobby prematurely. This can be avoided if you only take the time and a few precautions to make certain you get the baby steps out of the way without too much tripping and falling. Get the point? Many folks ignore this step until the last minute and we can tell you that trying to work a telescope without an aligned finger is very,very, very hard. Even the lower magnifications on a short focal length telescope only see a little under 1 arc degree of the sky. This is a tiny portion of the sky so hoping to find an object with just the eyepiece is really hard to do. There is a reason why almost all telescopes come with a finder scope. So make sure to align it (During the daytime per suggestion #1) . Just a quick note to our readers that our Post-Holiday sale is going on. We got pretty well stripped during the shopping season but there are still plenty of things to get. All science toys are 10% off, as is labware & microscopes. Geology items are 15% off! Come take advantage of this sale! Sometimes we get some cool toys in the store that have a bit of science, but are mostly just fun. 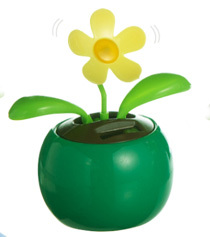 The new Solar powered frolicking flower is one of those toys. Place this ‘flower’ in sunlight and it will bob, weave, and dance. Its a fun toy for a windowsill, garden or other sunny location! Its stands just over 4″ tall, so it can fit between real plants. Its durable enough to live outdoors, so it can add a bit of fun to a garden or windowbox. We just have some time to say a few words: One of the more interesting astronomical events of this year was Comet LoveJoy and its near suicide run to the sun. Turns out it survived and is now visible with the naked eye – in Australia – before dawn. Check out the video! Gift Suggestions Made Because we have Videos of them! The Colorful and playful Crystal Lamp.